Oh dear....how the mighty have fallen. 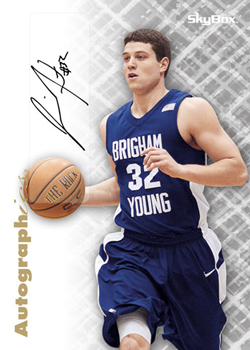 Upper Deck yesterday posted some images of cards from their forthcoming release 2011-12 Fleer Retro Basketball. Originally due to be released in April of this year, the released has steadily been pushed back and is now due to land in September. Whilst a five month delay could be regarded as an issue in itself, it is the above images that have caused the real consternation on my part. I have long had a hatred of sticker autograph cards. Whilst, I understand the economics for card companies of sticker versus on-card autograph cards, I still think that they were one of the worst innovations that has arrived within the hobby over the last decade. I understand that players have numerous commitments and are not as accessible to both collectors and card companies as we would like, in order that they can sign sports cards. But, I personally would see a lower number of on-card autograph cards released, as opposed to see the flood of awful sticker autograph cards that are currently produced each year. Upper Deck seem though intent on taking things to a whole new low. 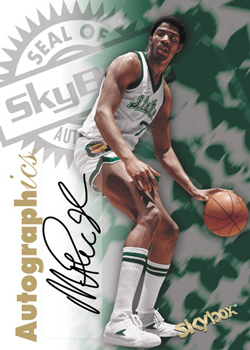 'Autographics' cards that first started to appear in Skybox products in 1996-97 took official autograph cards to a whole new level. The first 96 card set is legendary and the releases of the next few years maintained that high standard; with an excellent array of on-card autographs from a host of then current players. As regular readers of this blog will know, I am still attempting to finish the 1998-99 version of this insert set! So to see Upper Deck plan stickered versions of these classic 90s set, simply has me shaking my head. I was actually quite looking forward to this release and maybe adding another chase to my ever growing list. But seeing these images, I think it is fair to say I will stay away. When I consider some of the amazing basketball products that the Upper Deck was producing only a few years ago (Exquisite, Chronology, SP Authentic, Ultimate Collection to name but four), I do wonder whether we are really seeing the demise of this once great card company.